(May: Jessica M & Kim N; Jun: Jude F & Maggie W; Jul: Debbie T (we need someone for beverages); Aug: Kim U & Susan U; Sep: Jackie McG & Denise A; Oct: Emily S & Jody E; Nov: Pam E & Karen B.
Sign-ups are now closed for the guild and any open spots will be given to the DAMQG. Still working on Chris T for October or November. Looking at having him teach as part of a retreat and probably at Howell so everyone who wants to attend, can. It was suggested that we make sure he doesn't have a class size limit (Giedra will verify). Giedra has had a look at New Center which also is very nice. More to come on that at future meetings. She feels it is an amazing space but the contact person is out until June 1. 16 people have signed up so far - would like to have 20. 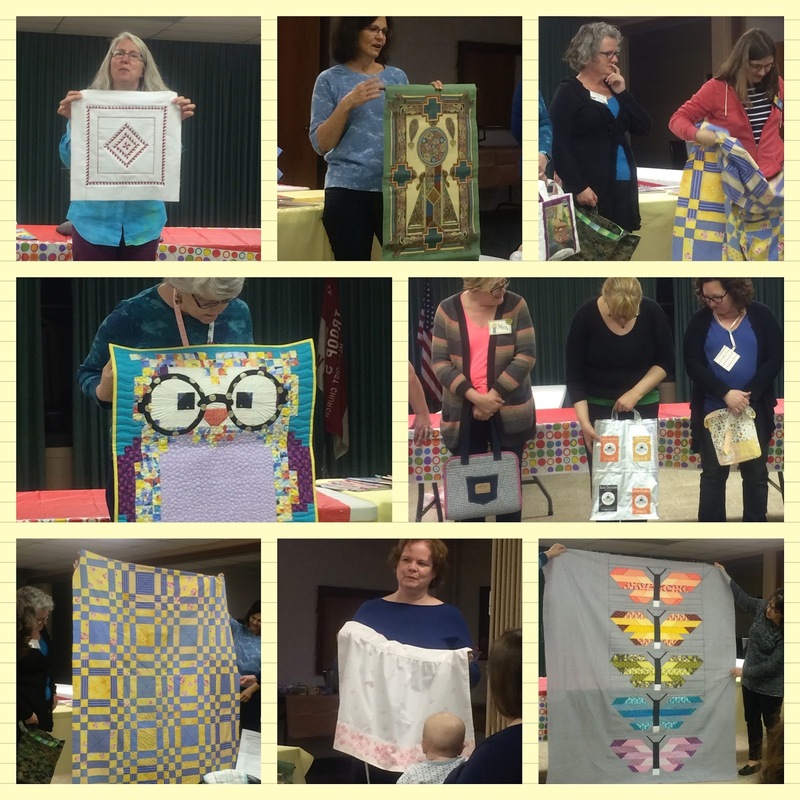 Final registration form needs to be turned in with your quilt at the May meeting. Make sure your mini-quilt is labeled and has a hanging sleeve or hanging corners. Giedra needs help with hanging the quilts and take down. Let her know if you are available on Thursday the 2nd and/or Sunday the 5th of June. Results of viewer choice voting will be announced at June meeting. Jackie Mills offered her yard but there does not appear to be enough interest to take part so we will table this idea for this year. MQG membership cards are in. See Jackie Mills if you didn't get yours. Pam Lincoln received a letter from Mott. She will forward it to Amy D.
Board is continuing to look at the idea of relay or team charity quilts. Contact Karen Burton if you are interested in forming a team. Anyone who takes part in a charity quilt will have their name put in a drawing for a prize at the end of the year. We will also reinstate having a charity corner at all retreats (although it was noted that this is entirely voluntary). Charity challenge - 12-1/2" blocks in red/white/or blue to make quilts for the Veterans. Bring to May & June meetings. Jackson Pieces and Patches Quilt Guild brought a sample raffle quilt and made a presentation on their Annual Quilt Show which is May 14-15 at Jackson Catholic Middle School. See http://jacksonquiltguild.blogspot.com for more information. GAAQG is hosting Cathy Miller at the May Quilt Day - May 21. She also is giving a hexie class on that Sunday. See http://www.gaaqg.com for more details. Casual Quilters of Brighton are having a quilter to quilter sale on May 2nd at St. Patrick's Church. Board is also considering an "Introduce a Friend to Quilting" day. There was interest in this event from attendees. Library: 7 new books - all with a modern slant! See Kim U to borrow. Skill School: Lynn Harris - Pressing Matters! 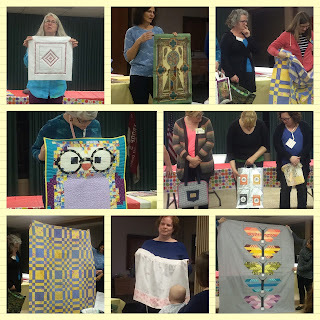 We shared our Upcycle Challenge projects (this month's Swap) as well as progress on Round Robin quilts and our monthly Show and Share. Board decided that Quilting Season is probably not going to work for our needs. Looking into Ann Arbor District Library free space - main branch downtown (see FB page for more details or contact Giedra). First sew-in set for Friday, April 8, 5:00-8:30pm. No food is allowed at this venue. Looking for May time frame for an all-day sew. A suggestion was made to look into Cleary University in Howell. There will be a pre-registration form on the FB page and here (BLOG). Need to provide an estimate of size. Due next meeting (April). Penny will be presenting a paper-piecing class in concert with her teaching at GlampStitchaLot. Each guild gets 10 spots - first come, first served. If you want to attend let Giedra know immediately. However, spots will be saved by check received by her - it won't hold your spot to just say your intent. Giedra is working on getting Chris Thomson (the Tattooed Quilter) to give a class in early fall. It will probably be a one day class on one of these dates > Sep 10-11, Sep 17-18 or Oct 15-16. We will not be hosting Lizzy House at present due to cost and too fast a turnaround to find a suitable location. Giedra would like members to give her ideas on what they want to learn - what she should be looking for when bringing in national or local teachers. Guild is re-instituting a snack sign-up for the social 1/2 hour before the meeting. We need volunteers for next meeting. The Board is looking into doing the Hwy 12 / Michigan Ave Yard Sale. We can use Jackie's yard, but she will be out of town. 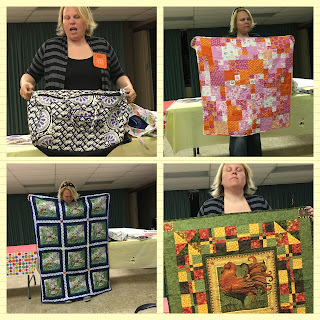 Charity Quilts - Amy S bought a box and added some fabric to start for kits or backs. A suggestion was made to have a 'pass along' project where someone signs up for cutting, someone else piecing, sewing, quilting, binding... We will be able to promote the sale of the eBay auctions at the Foodie Challenge - Zingerman's will have a space for signage (not big enough to show the quilts themselves). The Board plans on future charity projects to just donate the entire quilt to the charity to let them auction it themselves. 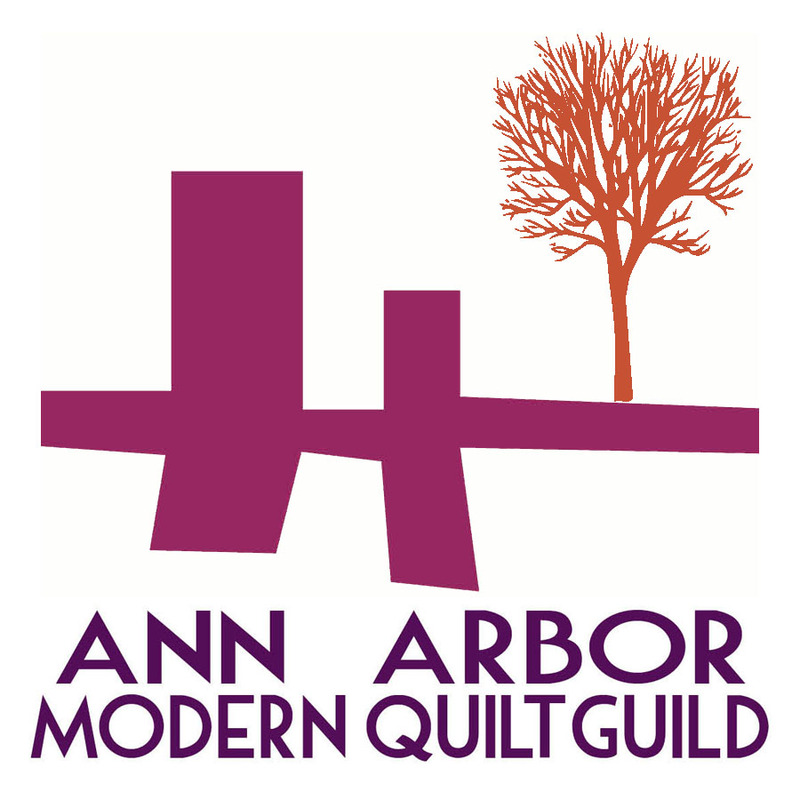 We are taking advantage of Pink Castle's book sale and will be purchasing approximately 6 modern quilt related books for the guild library. Debbie G noted that she and other get a discount with Fons & Porter (F&W publishing) plus several members have wholesale accounts (e.g., Checker) where they can purchase books often at 40% discount. There is a book missing from the library - if anyone knows the where-abouts of Kathy Schmidt's "Rule Breaking Quilts", let Kim know.